In 2007, I undertook a solo vision quest on Joseph Mountain in the beautiful Wallowa Valley of eastern Oregon, having felt intuitively called by my spirits to seek guidance in protecting the earth and securing a better future for all who dwell here. As one who has walked the shamanic path for twenty-two years, as an Earthkeeper, someone who attempts to discern what is best for the earth and all beings here and live accordingly, I was now being paged by my spirit team to receive messages on this topic. The spirits have appeared to indigenous people for centuries, and had been coming to me for more than twenty years in dream and vision, as well as to many of my students and clients, bringing profound insights and healing for us and our communities. I had a sense that I was making this journey on behalf of the Earth and my spiritual communities, as well as myself. Too many humans did not know how to live here properly; far too many seemed oblivious to the evidence that we were destroying our planet. I did not know what it would take to stop this. How could I do more, what were the right actions that could heal the planet’s suffering? I hoped a spirit would come to me in vision, and offer something I could bring back to my community that might make a difference. I was not in the best shape to make such an arduous journey, being fifty-four and with my backpacking days more than twenty years behind me. The climb would be seven miles up a steep rocky trail with a pack and water to a peak just under ten thousand feet. I would have no companions as a safety net. I called my spiritual mentor before I headed up the trail, to let her know my intentions, and she agreed to hold me spiritually, even though her wolf was dying at the time. Quests are unpredictable, and can be grueling. As I moved into the Spirit World, I wanted a human anchor here, to support me in facing whatever might come. As I steadily hiked the trail, I felt in every being around me— every tree, stone, cloud, chipmunk, spring — a loving consciousness, and a sense that they were all on this pilgrimage with me. It was as if the quest itself had awakened the spirits of this land, and they were gladly supporting my journey. I had experienced the same profound love on my first vision quest in 1994 in Joshua Tree, a flow of it that had emerged from the earth at the moment of vision after questing all night. Here it was again, at the beginning of this spiritual trek, love holding me, encouraging me, guiding me. I was honestly terrified to make this journey, for I was in bear, mountain lion and rattlesnake country. Yet I also trusted the Spirits entirely. This flow of love was a reassuring balm. If trouble or injury awaited me on the high peaks, I accepted the necessity of it. I had lived and worked long enough with the Spirit World to know my ancestors and spirits would keep me safe in every way they could. The upward hike was even more grueling than I had imagined. A high waterfall required hurtling myself across a five-foot stream at its base where it tumbled down a steep drop-off. I just barely made the jump, my feet sliding and staggering on the muddy edge of the fast-moving stream before they found safety. When I turned to look back, I discovered a couple at the fall’s edge debating worriedly whether to go forward, having observed my bold, precarious leap. Smiling ruefully, they shouted that they were turning around here, as the falls seemed too dangerous to cross, and headed back down the trail. Within an hour, I had to climb over several downed trees whose trunk widths were taller than me. The angled slope made this just as treacherous as the slippery falls, but after tossing my pack over first, I was able to scramble over each challenging barrier. A few miles more brought me to a spring where I soaked my swollen feet and sponged my aching knees, and listened to a friendly fly inform me that my boots weren’t tied tightly enough, that my joints needed the support of a firmer fit. Thank you, Fly! 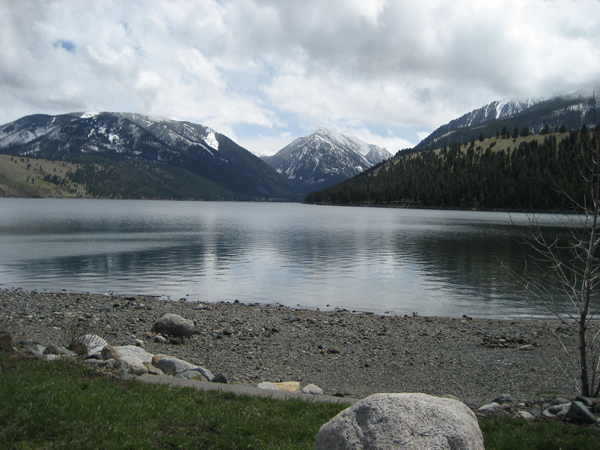 After a full seven hours of hiking, I stumbled into a meadow at the top of Joseph Mountain, and stood among tall pines gazing out over the five-mile stretch of Wallowa Lake and the green forests below. I dropped down to the earth, just resting and observing the open meadow with its sprawl of scrub sage and the rocky peaks rising up before me. I noticed a young pine broken in half in between two tall mature ones. Although the top of this pine was split and hanging, the tree was healthy and vibrant. I marveled that a being so severely injured could still thrive, and felt as if the Elder trees were watching over her. I felt broken too, felt that all of us humans here were deeply wounded in our hearts and minds. The spirits were watching over us, it seemed to me, and were our elders. Perhaps we too could still thrive with proper tutelage. An old man and his dog arrived briefly, and we chatted. He asked if I would be camping here, and I evasively answered I had not decided yet. I did not trust men in the wild, particularly not men who would know I was alone here in the shadowy night that was fast approaching. But he seemed kind enough, and I did not feel in danger. I asked if there were any bear troubles up here, and he said he had never encountered one on the mountaintop, and that he did this hike three times a week. I had traveled through a long series of switchbacks as I climbed the seven-mile trail but he told me there was a two-mile path he used that went pretty much straight up and down, and only took two hours. He confessed he had met with mountain lions on a few occasions, but they had never threatened him, just followed him with what he felt was curiosity more than predatory intentions. I felt my heart stall a bit at this information, imagining myself stalked by lions. I quickly tuned back into the lovingness that was still there floating around me, and my anxiety eased. The man waved goodbye and hiked briskly back down the mountain. A part of me wished I was going down too, before the light ended, down the straighter, easier path, not alone, and not having to spend a solitary night in hours of darkness with no tent. But I stayed, committed to the feeling in my body that said I belonged here now, whatever might come. I created my medicine wheel out of a few small grey stones, made tobacco offerings, then set up my blue sleeping bag in a circle of small sage plants. I watched the sun pull the light off the lake, and the shadows drop into everything. I offered four rounds of prayer, one each half hour, as guided by my spirit council. A vast silence seemed to hold everything in expectation, and I settled into the long quiet that I have come to love on quests. After an hour or so, the spirits encouraged me to rest, as there would be work to do later. I slept briefly, dreaming that I was explaining to one of my students that when a deer comes in a dream we must observe the deer’s behavior so we will know what message it brings. Suddenly the sound of drums awakened me, an ancient Native American four-beat rhythm. Had Native people arrived below in the campground at the base of the mountain, or perhaps someone who knew this pow-wow rhythm? I was deeply moved that drummers were here now, felt the hunger within me for this ancient song pounding through the forest. This strengthened my resolve to hold steady here, despite the waves of fear that sometimes washed over me like a small tsunami. The drums took away all concern that I was a fool on a fool’s errand. My ancestors were letting me know that I was welcome here. As the stars offered their focused beacons in the charcoal sky, I felt their presence, how alive they were. They too kept company with me, embracing me in the same abiding love I had treasured coming up the trail. I felt I was in the stars, had never been so close to them, so fully with them. Tears of awe opened my tender worried-about-the-earth heart, and my own affection flowed out to everything around me. I loved this earth so much! How lucky I was to be here, in the forested wild with my beloved earth mother. I felt so grateful for this mountain solitude peopled by spirits. I hunkered down into my sleeping bag as a chilling wind picked up, and lay down to simply gaze at my ancestors, the stars. Hours and hours passed as I lay awake on the dark earth. Spirits arrived and offered personal messages on my own growth and healing, which I greatly appreciated. But for the bigger question, of how to help the earth, I waited patiently, knowing the spirits work in their own time and ways, and that one cannot rush or force contact. The night was calm now, except for the sound of running hooves at one point, which made me wonder if a deer was being chased by a mountain lion. I was glad it was too dark to tell. The vision that I was seeking arrived shortly before sunrise. A spirit made of smoke floats in the air before me. I sit up to see him more clearly, and he leaps from sky to earth, and now stands in front of me. He is larger than me, looks almost like a lion, or a griffin, a bit shape-shifty and not clearly definable. I am given information by my spirits that he is one of the guardians of the earth. After sitting a moment in respectful silence, I ask: what is our future and what can we humans do to meet it? How can we bring healing to our poisoned planet? He responds in the voice of an oracle. “You have destroyed the precious waters of the earth.” I think of our human-made chemicals, oil spills, pesticides, pharmaceuticals, all leaking into the aquifers, rivers, lakes, and seas. Have we destroyed them entirely already or is he talking of the future here? He opens his great mouth in a mighty roar and fire pours out; flames spread across the earth destroying forests, homes, people and animals. A second blast of his voice and a fierce wind births tornadoes and hurricanes that spin across the land, shattering everything in their path. The griffin calls out a third time and great floods sweep away whole towns and their inhabitants. With his last roar, stones roll from his huge mouth, and avalanches, earthquakes, and volcanoes crush and bury everything around them. Grief-stricken, I struggle inwardly, searching my own mind for some way these disasters can still be prevented. “Shall I speak of this to others, warn them, so that perhaps the humans will change?” I suggest hopefully. Distraught, I plead one last time for a reprieve. But humans would not cry such tears yet, I believed, for we were still too arrogant, too greedy, too ignorant of the full consequences of our behavior. My own tears surged now. Broken-hearted, angry that our reckless, thoughtless human ways had led us to this place, I watched as the griffin disappeared, his grey smoke form turning to black ash, a dark snow drifting down to the hard, dry land. I was stunned and disheartened by the griffin’s fierce message. It was not what I had expected or hoped for. I was wary too, initially, for I had never met a spirit quite like this before. I did not want to believe that what he said would come true. Yet a part of me already knew, what my own spirits now gently confirmed: the griffin was no trickster spirit, teaching with pranks and lies, but one of the truth- tellers. I finished out the night with a sacred song calling on the ancestors for guidance in how to meet so bleak a future. Environmentalists and indigenous people had been fighting for years with our governments and corporations trying to stop the poisoning and warming of the earth. Might these efforts save us from such a devastating future? If not, what else would it take? And how many years would we wait before the humans would come to that tender-hearted place of remorse for all the harm that we have done here, all the injustice we have inflicted upon other species, the lands, the waters, one another? When dawn came, I placed my Pendleton Circle of Life blanket on my shoulders and sang a welcome to the returning light. I left an offering of a turtle necklace on the blasted tree, with one last prayer for healing for us all. Then I descended the mountain uneasily, knowing I did not have enough water for the trip, and that my body was still battered from the hard climb the day before. I hiked the direct, steeper trail down, hoping to save time, but it was equally grueling, every step a jolt to my agonized joints and ravaged muscles. The last hour of the trek I cried most of the way, due to the pain in my body, and the grief of my vision. But there was also a moment when the spirits made up a silly song, with the words “Walk like a Bear” which we sang over and over to distract me from the terrible knives in my joints. I laughed then, grateful that the spirits were keeping me going when I wanted to give up. By the time I staggered to the trail’s end, I had so much rampant inflammation I begged two middle-aged campers to give me a ride from the lake’s edge back to my car at the trailhead. They glanced at me suspiciously, but when I explained how much agony I was in from my four-hour hike down the mountain, they kindly provided a lift. Afterwards I drove to the lake, knowing I needed ice for all the swelling and the lake would provide it. I gratefully soaked in the river-chilled waters and my suffering eased. What I didn’t know yet was that these were not mere muscle and joint aches of over-exertion but the first flare-up of the rheumatoid arthritis that would shatter my life within the next few years, and teach me that human contamination of the earth, waters and air was rapidly increasing autoimmune diseases. Our human bodies were poisoned too, unavoidably, and the most sensitive among us were already paying a painful price. I was allowed by the griffin to share this vision with my mentor, but several years would pass before I was given permission to speak of these prophecies with a few of my students in my shamanic training program. Only now am I requested to share it publicly with a wider audience, now when so much of it has come to pass. We humans are destroying our home, this beautiful earth being, our mother. We know we are doing it and yet we cannot seem to stop, cannot make the changes quickly enough. Each day there is more climate chaos, blizzards and hurricanes caused by global warming, earthquakes caused by fracking, dying sea lions and other creatures whose territories can no longer provide enough food due to damaged and diminished ecosystems. Many creatures, like the bees, are wasting from diseases caused by the deadly chemicals we have poured upon the plants. Oil spills are frequent; radiation is steadily leaking into the sea, air and land from nuclear power plants. The horror of our current reality has more than matched the griffin’s prophecy. As the truth of the griffin’s predictions unfolded across the globe, I continued to ask for dreams to help us know how to transform this fate. In 2013, I received this dream. A young man has been harming others. I firmly move him away from his girlfriend, and tell him we will not allow him to hurt her ever again. He sneers angrily — “Oh, yeah?” — daring me to stop him. I move closer to him and stare fiercely into his hostile eyes to show him how serious I am. He yells at me to get away from him. “Do no harm.” I speak these words to him slowly and emphatically. “Do you know why the native people say this?” He shrugs sullenly, as if he could care less about anything I might say. “Because we are all family here, we are here to protect one another, to help one another.” He looks away, still feigning indifference, but I sense he is now listening. “If you allow us to help you, we might be able to turn you into a true human being.” I say this in a half-joking manner, but I am serious. This community of people who know how to take care of the earth, who have learned not to do any unnecessary harm, are his best hope for healing his angry, wounded heart. My understanding of our global culture at this time is that it is predominantly shaped and controlled by an immature wounded masculine energy. We humans are not grown up yet, do not know how to live wisely and compassionately with our resources and one another. Some people know more about what might be possible than others, and much of this knowledge seems to be held by certain elders and communities who are committed to guarding the earth. Communities can do what individuals cannot, as this dream suggests. Communities can heal individuals who are doing harm to others due to their own unhealed trauma. Communities can stop fracking and block the Keystone pipeline. Communities can heal our poisoned waters, lands and air, by holding companies accountable for the effects of their actions, by refusing to allow them to continue environmentally unsound practices. Communities can stop our politicians from sacrificing our long-term future for short-term benefits for the extremely wealthy minority. I also believe that the spirits, who have been with us since the very beginning of our human journey, offering to teach us how to live in right relationship to our ecosystems and other species, are essential to whatever possibilities might emerge. Corrective visions, such as the one I had on Joseph Mountain, have come for centuries to communities and their seers, shamans, and medicine people, when people were no longer living in right relationship to the earth. Black Elk, the famed Lakota medicine man, shared such a vision from his time about how European life practices would destroy indigenous ways of living harmoniously with the plants and animals. There once was a Lakota holy man, called Drinks Water, who dreamed what was to be; this was long before the coming of the Wasichus (Europeans). He dreamed that the four-leggeds were going back into the earth and that a strange race had woven a spider web all around the Lakotas. And he said: “When this happens, you shall live in square gray houses, in a barren land, and beside those square gray houses you shall starve.”* They say he went back to Mother Earth soon after he saw this vision, and it was sorrow that killed him. You can look about you now and see that he meant these dirt-roofed houses we are living in, and that all the rest was true. Sometimes dreams are wiser than waking. Sadly, the animals are leaving the earth; more than fifty percent of the population has been devastated by destructive human activities in the last forty years alone. The waters are poisoned, as the griffin foretold on the mountain, as the leak at Fukushima guaranteed would happen. Looking around now, we must bear witness to the harm humans have done to so many beings, and to one another. Drinks Water was killed by the sorrow of his vision, and I sometimes wonder if I developed rheumatoid arthritis in part because of the grief at what I witnessed of our broken human future. But I have not given up hope, because of the many dreams and visions that are still coming, that have encouraged me and others to learn to live in healthier and more balanced ways. In the high desert of Joshua Tree a few months ago, I quested once more upon the land, this time only briefly, as that is all my health allowed. I asked the griffin to come once more and offer guidance for humans. I smoked the peace pipe I have used for many years as I prayed for help. And then he appeared before me. I was so grateful that the griffin had returned, and for his words. His response made me believe that healing the earth and our own broken hearts and minds is still possible. But only if we open once more to the spirits and the ancestors, to the Mystery itself, and return to their sane and thoughtful ways. The plants have been on this planet more than 450 million years, the animals have lived here more than 350 million years. Humans, in their current form as homo sapiens, have only dwelt here for 220 thousand years. Who should know more about what works here? The plants and animals are our Elders. These and other helpful spirits can bring humans back into the knowledge that we are all family here, all one being, here to take care of the earth and one another, as the griffin reminds us. Many have forgotten how to connect to the spirits, how to hear them, see them, believe in them. Yet it is not a hard thing to do, as the following dream from December 30, 2014, suggests. I am watching a young girl, perhaps seven years old, standing in a kitchen, keeping an eye on a pot on the stove. Suddenly she dances, raising her arms up and down like a butterfly, twirling and hopping and dipping flamboyantly. As she moves, I observe that a translucent tunnel has formed around her, linking this world to the spirit world. The tube rises high into the sky, I can see it pierce the roof and keep moving. I marvel at this young child’s capacity to create this connection to the spirit realm and think that I should tell her mother what a gift she has for magic. I wonder how to tell her in a way that would make both the child’s ability to do this, and my capacity to see it, acceptable. Shall I say it was in a dream? I fear she will consider such a vision with suspicion. I realize she thinks that I created this magical path to the spirits. I correct her, explain that she is the one who created the passageway through her full-hearted dancing. My gift is to see what is often invisible to others. “You are the amazing one!” I insist, and she offers a wide, delighted smile. Dancing is one of the most ancient traditions for entering the Spirit World, or bringing the spirits down to us, sometimes even into our own bodies. But there are so many ways to make this essential connection. We can send a part of our spirit into the spirit realms with proper training in shamanic journeying. We can create artwork and masks that invite particular spirits into our lives. Meditating, dreaming, singing, writing are all time-tested forms for communicating with the spirits, simply opening our hearts and minds to their teachings as we engage these forms. The spirits will come, will speak, will teach, if we ask them to, if we receive them humbly and warmly, as our ancestors once did. They have not given up on us yet. Once, early in my shamanic training, the spirits said to me: “Be not ashamed to follow.” We are the youngest beings on this planet. If we seek help, if we follow the guidance of the spirits, change and healing is still possible. Then we can say thank you, bless you, and start again. 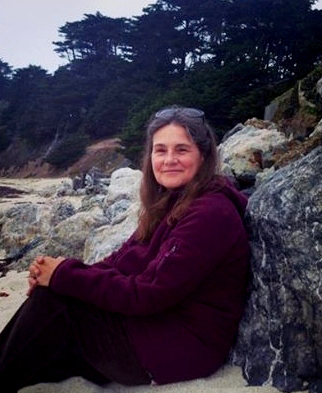 Valerie Wolf is a shamanic healer, dreamer, teacher and writer who lives in Santa Monica with her husband less than a mile from the sea. Her lineage includes Native American and Celtic ancestors. She offers individual healing and training sessions for private clients. She is currently writing a book on a shamanic approach to dreaming that was taught to her by the spirits.